It's a familiar brunch scene: glass after glass of Prosecco, accompanied by a side of eggs Benedict or some other thing that's not nearly as interesting as another glass of Prosecco. 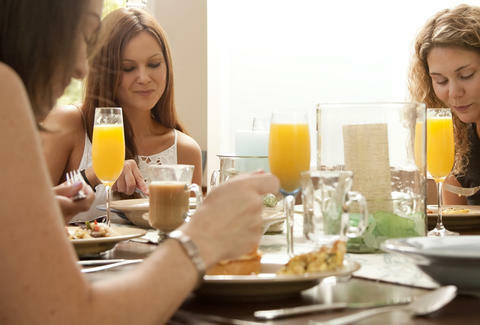 But here's the problem: your favorite brunch beverage might be getting more expensive. Last year, Prosecco saw record supply numbers, according to Bloomberg. But thanks to skyrocketing sales -- up 38% last year in the US, and 72% in the UK -- Prosecco producers are having a tough time keeping up with worldwide thirst. Which, if you believe the falling-sky headlines around the Internet, means PROSECCO IS RUNNING OUT. This does not mean that. While not technically incorrect, saying the world's supply of Prosecco is running out is like saying the world's supply of pizza is running out. True, in that for every pizza eaten, that's one pizza fewer you can eat right now. False, in that somebody will make more. What it really means, however, is that as demand rises and the supply stays the same -- what your high school economics teacher called "scarcity" -- prices will rise. "Everybody who wants to buy a bottle of Prosecco will get it. It might just be a bit more expensive," Karl Storchmann, Clinical Professor of Economics and Managing Editor of the Journal of Wine Economics, told Thrillist. "In the short run it will be hard to produce more. Maybe in 3 to 4 years." Mike Veseth, known to the world as The Wine Economist, agreed. "It is my impression that the wise wine people in Prosecco-ville will adjust supply regulations to accommodate the rising demand," Veseth told Thrillist. "Prices may rise and very cheap wines become harder to find, but I don’t think we will run out of Prosecco." Storchmann went on to say that price increases will hardly be noticeable for most consumers, given the volume of brands and producers in the market. In the meantime, he suggested, sparkling wines from other countries might cut into Prosecco's dominance. "It’s likely that other low price sparkling wines jump in. Spanish Cava?" he said. "There are sparklers in every country. Although, the price-quality ratio for Prosecco is outstandingly good." Plenty of basic brunchers can attest to that. It's just that in the immediate future, you might be drinking more sparklers from around the world -- or at the very least, coughing up more cash for your Bellini. Ryan Craggs is Thrillist's Senior News Editor. He's more of a Lambrusco drinker when it comes to sparkling Italian wines. Follow him @ryanrcraggs.